Slightly belated news from the Irish Breeds Society Show with a wonderful result for Glens; Abberann Phelan was Reserve Best In Show and Abberann Conan was Best Veteran in Show…nice! Over in America at Agathon Kennel Club Best of Breed, and OHG2, was Tipperary Violet Dowager Countess who can now put Ch in front of her name, Best Dog was Daulton’s Rory. Sunday Agathon had Rory BOB (with Group 3) and Emerald Isle Keely with Daulton BOS. Violet finished off a good weekend by getting the nod for Bred By Exhibitor Gp1. ….so what have Glen of Imaal Terrier people been doing recently? At Western Pennsylvania Kennel Association the Saturday Show Ch Daulton’s Princess C Hatteras was BOB and called into the Top Spot (Group1) in the Owner Handler Terrier Group, Tipperary Columbo was Best Dog. On the Sunday Columbo was again Best Opposite but this time behind his kennelmate Tipperary Violet Dowager Countess. Paper Cities (Wisconsin) saw a return to the ring of Abberann Torcan who annexed a Group 3 and 4. Uttecht in the Netherlands saw Cairdiulacht Breannainn Mac Angus be awarded BOB with Madra Áthas Aoife Aideen an tSolais) was judged BOS. At Sligo and District Stiubhard Hit The Road Jack was Best Baby Puppy In Breed, first rosettes are always so good! Also we’re hearing of some more Barn Hunt success-c’mon Jeff, share with us and what about the Owner Handler Group 4 sent as a “breaking news?” Susan, the show is needed! 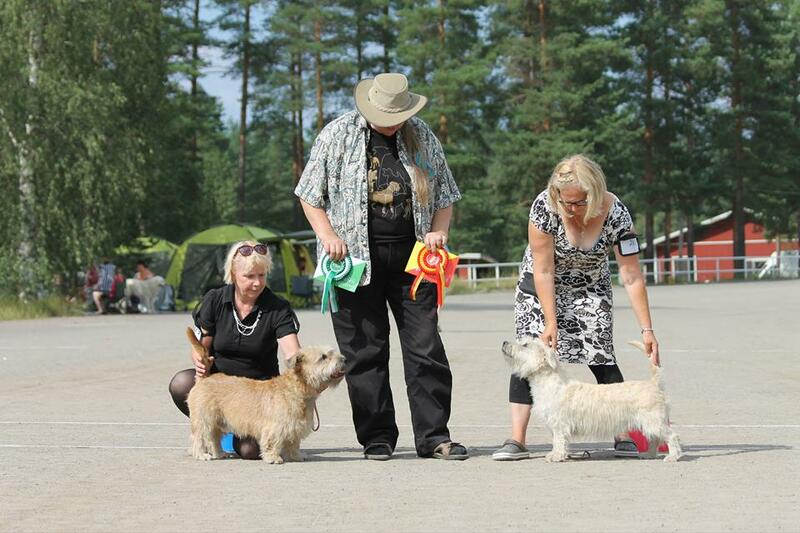 A cluster in Ohio and three Best of Breeds for Tipperary Violet Dowager Countess whilst in Finland a BOB for Stiubhard Cutie Pie at Gleann with BOS being awarded to Gleann Ungus MacGuire. 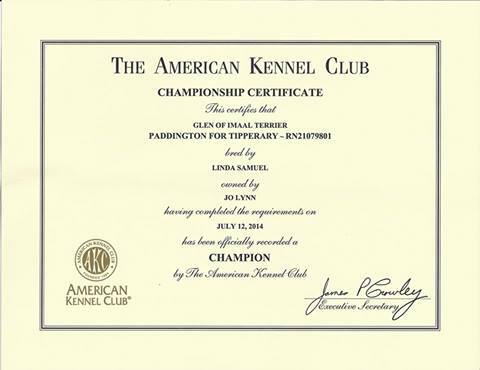 The latest Glen of Imaal Terrier Champion in America now has his AKC recognition certificate and it’s always nice to know that dogs exported “cut the mustard” in their adopted country so congratulations to breeder Linda Samuel and owner Jo Lynn. Paddy-Paddington for Tipperary-makes Champion number six for Jo and all (Tipper, Rosie, Lee, Danny, and Daisy) have been handled personally!